I have a question for all of my friends who serve the automotive industry: How much do you believe in your product or service? Enough to fight to get it in front of the right person at the dealership? I was recently invited to participate in a live broadcast of Auto Dealer Live. I was the only vendor on the show. The other guests were discussing how they view vendors and how the vendors should approach them. It was eye-opening to say the least. But, having been on the dealership side before transitioning to be a vendor, I knew first-hand what this looked like. You see, I WAS the gatekeeper. I was the one who sat through your presentations and decided whether this matter – your matter – moved along or died on my desk. This position gave me great insight into several things. First, I got to witness your pitch. Next, I was lucky enough to be subjected to your follow-up (or lack thereof). I can tell you one thing: there are some amazing products out there for dealerships, and I can see where this maze can become overwhelming for anyone at a dealership to muddle through. There are also some lame products and services being pitched to dealerships. I once did a marketing audit for a dealership in St. Louis. These guys were paying $10,000 per month to have a weather cam, pointed at the interstate, on their building. It was a live feed for the local TV station. They paid to supply the TV station with a live cam feed. And they had to pay for the camera and the installation! People, someone was a fantastic salesman. I mean, what the hell?!? But back to the show. There were some great dealership insights about follow-up, passion and culture. You can check it out here. but not for vendors, so I’ll just tell you what it looks like to me. First, I only take referral business. So when someone gets on my list, they are a very warm lead. I reach out immediately with whatever contact info I was given. If it was a cell phone, then I will text the number and ask for time for a call. If it was an email, I will email them and ask for a good time to call. But you can be sure that I never wait to make the initial contact, and I note the results in my CRM (it’s actually a planner, but I use it as my CRM). If they suggest a time for me to call, I send a meeting invite, and note it in my prospect list in my CRM. The initial appointment is always met. It’s a rare occasion that I reach a prospect right off the bat when they ask me to call, but I leave a voicemail and follow up with an email or a text for alternative times. I continue to follow up until they let me know it is no longer welcome. Why? Because I have worked in a dealership, and I know it is a very interruption-rich environment. I know the GM has everyone from the Fixed Ops Manager to the detail guy popping his head into his office to request his immediate attention. I’ve sat outside of offices 2 hours waiting for my opportunity to get 5 minutes. So, yeah, you bet I follow up. If I know they are definitely interested and I’m positive I can solve a problem for them, but I just cannot get in front of them, I will schedule a face-to-face visit. Now they know I’m serious, because usually I have to fly in to see them. But you can guarantee that if I let them know I’m on my way, they will either take my call or schedule a meeting with me when I land. I realize that not all of you can do that, so you’ll have to figure out another way to get through the gate. But once you’re there, please be prepared. Know the dealership’s data and all of the points that will solve their problem(s). Their time is valuable, so if you want to serve them, speak their language and prove you’ve done your homework. There’s nothing more frustrating for a dealership than for a vendor to show up, uninvited and with no appointment, only to try to solve a problem they don’t have and sell them a product or service they don’t need. But if you’re certain you can help them solve a problem or gain missed revenue – by all means, don’t stop following up until they demand that you do. Even then, I wouldn’t delete them from my prospects list. I would move them out to every 3-6 months instead. You see, needs change, leadership changes, and marketing tactics normally adjust to leadership and market influence. 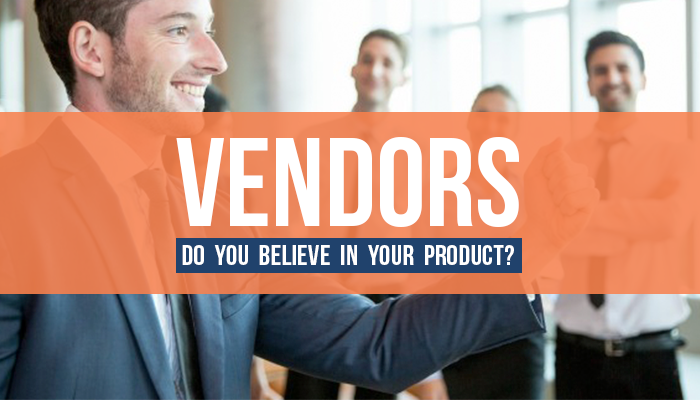 In summary, if you’re a vendor and you know your product and its features and benefits – and know your prospect and his/her pain points and are certain your product is a match or a fix for their needs – don’t stop reaching out to them. They need you, and you know it. And soon enough, they will know it too.